"SafeSaver” by “SafeSaver” is a browser adware extension (plug-in) that displays coupons with offers and advertisements when you are shopping online. The program publisher claims that you can save money when you buy online, but when this program is installed on your computer, it displays advertisements from unknown publishers. 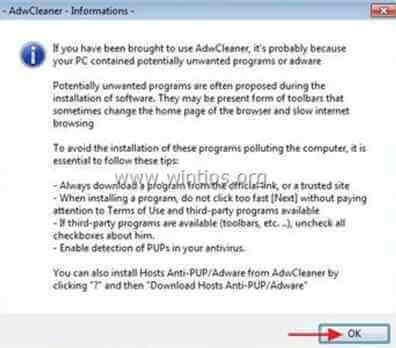 The "Safe Saver" plugin is commonly bundled inside other software installation programs and for that reason you must always pay attention when you install free software on your computer. Step 1. 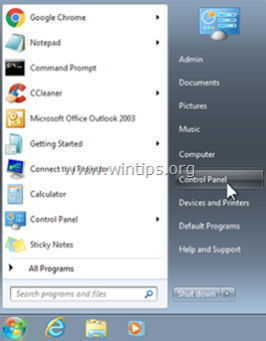 Uninstall applications installed from "SafeSaver” from your Control panel. Notice*: Close all web browsers before you uninstall “SafeSaver”. How to remove “SaveSaver” extension from Internet Explorer. 1. Open Internet Explorer and then open “Add-ons” manager. To do this from IE’s file menu, choose “Tools” > “Manage Add-ons”. 2. Choose “Toolbars and Extensions” on the left pane and then select (one by one) and disable all “SafeSaver” extensions. 3. Close all Internet Explorer windows and proceed to Step 3. How to remove “SafeSaver” extension from Google Chrome. 2. Choose "Extensions" on the left. 3. In “Extensions” options, remove the “SafeSaver” extension by clicking the recycle icon at the right. 4. Close all Google Chrome windows and proceed to Step 3. How to remove “SafeSaver” extension from Mozilla Firefox. 1. Click on “Firefox” menu button on the top left of Firefox window and go to “Tools” > “Manage Add-ons”. * If “SafeSaver" extension exists, remove it by clicking the “Remove” button in that line. 3. Close all Firefox windows and proceed to the next Step. Step 4. Clean your computer from remaining malicious threats. 2. When the "Malwarebytes Anti-Malware" main window appears on your screen, choose the "Perform quick scan" option and then press the "Scan" button and let the program scan your system for threats.